Mainly, the cities in Japan are built on with low-rise buildings spreading throughout the horizon; occasionally, there are unremarkable high-rises – business centers, which are regular glass cubes, no superfluity. There’s a lack of modern architecture in Japan, if you ask me. And I didn’t see any historical buildings at all. Skyscrapers aren’t so popular there because of the frequent earthquakes, there’re only high-tech buildings on some anti-vibration bedding and stuff. You can find tons of videos with dancing Japanese high-rises, on YouTube. Frankly, after the trip, it seemed to me that it is not a place for roofing, but rather for discovering the local culture. The culture is great there. You may characterize Japan with just one word – Regularity. In this country, everything is proper and everybody is proper, but not as a role model for us to follow, quite the contrary. It amazes you at first – the cleanest streets and houses, regular housing with private mini-gardens, no noise in the streets even next to busy freeways. But after a while, it all pressures you. It feels like utopia. Everybody is the same. All guys wear black suits, women smile at you and bow to greet you. There almost isn’t any social contrast. Possibly, it’s all because the difference is in the mindset. Maybe it’s just the first impression, which is often false. But this is how I see Japan now. There was one occurrence in Japan, which I can’t get out my head. Once we were on our way to our place, it was late and we came across pipeline road works. The soil was turned up all over the place, the road was closed for traffic; there were a bunch of traffic cops pointing where we should bypass the obstacles. The next morning, we were going to the metro station the same way – there were no road works already, it was all perfect again. There was only one small seam on the asphalt where there was a huge ditch a day before, telling us it hadn’t been a dream. Gambling and video games are big in Japan and the players are both children and adults, from different social classes. In the picture above, there is a bunch of middle-agers – many of them come to play right after work. You come across places like this a lot, and you can hear them from far because of the noise coming from the inside. Some shots in this post were made from balconies or through glass. For instance, this one was even taken from a business center’s restroom. In Tokyo, it’s a challenge to find ancient buildings. On the 1st of September in 1923, a major earthquake took place in Tokyo and its outskirts (ranking 8-9 magnitude on the Richter scale). Half of the city was destroyed. Also, the city suffered dramatically during the World War Two, receiving mass airstrikes. Such kind of wells inside high-rise residential houses is also a common thing there. This shot was taken from the view point of the Tokyo city hall. Shibuya district. Plenty of boutiques and malls are bunched up there. It’s the core of night life in Tokyo. A roofed baseball arena. Baseball is big in Japan. An amusement park. I personally recommend taking a ride, if you’re in Tokyo. Japan is very expensive. Apart from expensive tickets and hotels, local stores and metro rides are also dear. It would take hundreds of rubles to get from one end of the city to another. It depends from the traveling distance. But don’t you anticipate that a one-station ride would be cheap. You can see the suspension Rainbow Bridge and behind it the futuristic Fudsi TV building. The new Tokyo TV tower called Skytree – the world’s second tallest structure. Tokyo at night is boring. Tokyo is also such a big city and it’s easy to get lost if you don’t have good directions to follow. Luckily for us, we had our Huawei P7 smartphone which gave us almost instant access to Google maps no matter where we were. It’s unusual that in general street illumination in Tokyo has neutral color. You probably can’t spot it in the photo, because I’ve warmed it up a little. At the background, there’s the Tokyo Gate Bridge with very interesting design. After Tokyo we made for Osaka to climb up to the tallest suspension bridge in the world. The Akashi Kaikyo bridge crosses the Akashi Strait and links the city of Kobe on the Honshu Island and the city of Awaji on the Awaji Island. They make tours to the bridge, for which you can sign up in advance. First, we went up to the bridge with other tourists, and then at night we went up ourselves, walking on the stay cables. Before the bridge was built, there was a ferry line across the Akashi Strait, which is an international waterway. This dangerous waterway frequently suffered severe storms. Thus, in 1955 two ferries sank there during the storm. There were 168 children among the victims of the tragedy. That gave impetus to the bridge construction. The Akashi Kaikyo bridge is mentioned in the Guinness Book of World Records twice – it’s the world’s longest suspension bridge and the tallest one, as its pylons are 298 metres (978 feet) high, which is taller than a 90-storey building. Afterwards, it was exceled by the Millau Viaduct in terms of the pylon height. If you put along a line all the steel threads (5.23 mm (0.206 inches) in diameter) of the Akashi Kaikyo bridge’s catenary wires, you could wind it round the Earth more than seven times. They let tourists go up to the top only in small groups. Many are so terrified of heights so they can’t approach the fencing to see the view from the pylon. The bridge is the tallest suspension bridge in the world. Its total length is 3911 meters (12,831 feet), the central span is 1991 meters (6,532 feet) long, the two other sections are each 960 meters (3,150 feet) long. The catenary wire, which we walked to get to the bridge’s top at night afterwards. The bridge abutment. In fact, this “cube” isn’t solid. Inside, the catenary wire is divided into thousands smaller wires, which are fastened evenly to the back to distribute the load. 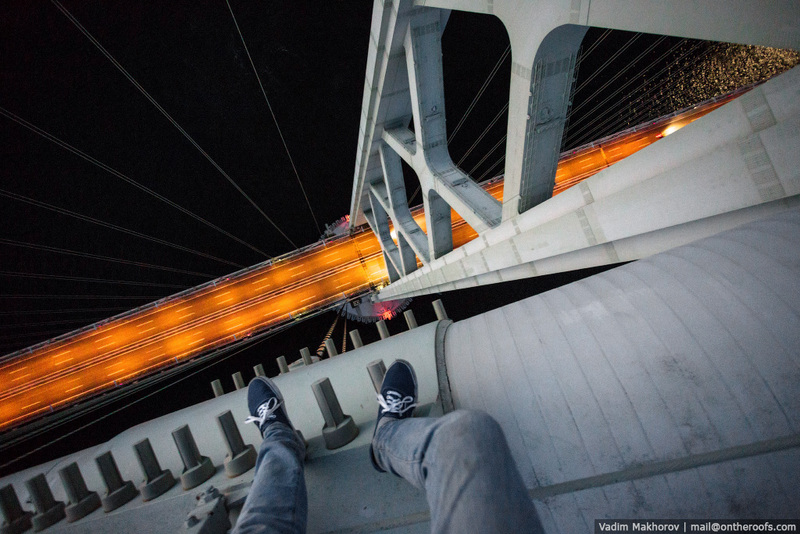 At night, closer to the dawn, we climbed up the bridge walking on the stay cables. The similar shot, but without feet. I took all the shots holding the camera in my hands, as the shaking wire made it impossible to use a tripod. I shall finish with the pictures from the abandoned amusement park. It was my little dream to visit such a place, and it came true in Japan. In Japan, there’re many different amusement parks, and there used to be even more of them, as many closed down due to financial circumstances during ‘90s and 2000s. Afterwards, almost all of them were demolished and the Nara Dreamland park, situated near the ancient city if Nara, seems to be the only one left so far. The park opened in 1961 and its equipment seriously went out of date, according to the present standards. In 2006, it was closed due to tax dodging, they say. The park’s key attraction was a classic wooden rollercoaster called Aska. Exactly wooden, as originally rollercoasters were made with wood and only rails and fasteners were steel. Such rollercoasters typically don’t have upright descents and loop-de-loops, yet they look gorgeous. Everyone can visit this place – just don’t catch the guard’s eye. It’s amazing how well such abandoned sites are kept in Japan. It would all have been vandalized here in Russia. The main attraction in that place is the wooden rollercoaster. Another cool place – a chamber of horrors. 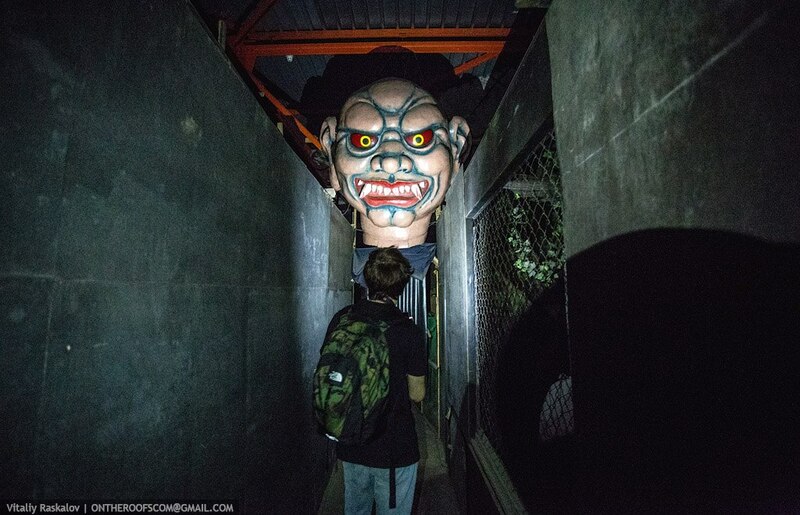 In fact, it’s a huge tunnel with scary figures. In the total darkness, these figures scared even me, so I can’t imagine how a kid must feel there.